Jeddah - A teenage girl defied a Saudi ban on women drivers to save her father and brother from the freak floods that killed 122 people last November. Malak Al-Mutairi took some rope and drove her father’s GMC to the low-lying Qous Valley where water had nearly submerged the car her family was standing on top of. She parked her car at an elevated position on the road and waded into the water as far as she could before throwing the rope to her brother, Al-Madinah newspaper reported. The brother tied the rope on the car and then Malak slowly towed the vehicle out of the water. When her brother fell into the water she returned to help him. There were other submerged cars with people inside them crying for help. Despite her father’s pleas not to return, Malak managed to tow eight more cars with dozens of people inside to safety. “I had to brave the terrifying floods and rain to rescue my father because no one responded to his call for help,” said Malak. Al-Mutairi was proud that his daughter had saved many people. “My daughter has a strong personality. Nothing, even floods, deters her when she is determined to do something. No ordinary girl would have accomplished what she did in such weather,” he said. Hind Al-Doussary, a woman rescued by Malak, said her driver could not do anything to save her and her children. She said if it was not for Malak all of them would have drowned. "My early days roaming around the Shakai streets wearing boys' clothes and fighting against them eventually made me an independent young woman." 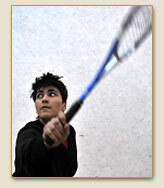 Pakistan’s squash champion Maria Toor Pakay cut her teeth fighting boys in a tribal district synonymous with the Taliban and Al-Qaeda, defying convention to become a trailblazer in her sport. She hails from South Waziristan, part of Pakistan’s tribal belt branded by Washington as the most dangerous place in the world. It is rife with Islamist militant groups, while tribal customs often force women to remain at home. None of that stopped 19-year-old Pakay, however, who is now Pakistan’s top-rated female squash player and the world number 85. But her determination to defy tradition and champion girls’ sports in the conservative northwest has won her some enemies. “I have received some threats from unknown people who have advised me to stop playing and going out of the house, otherwise they would kill me. But they can't detract me... I would never quit playing,” she tells AFP. "At the beginning it was hard, but now I can do anything." Cairo - Imagine “Men in Black” meets hijabs and neon eyeliner. Dressed in identical black suits, white-collared shirts, and silver head scarves, Dwleat Nanvey and Maha Hamied are part of Egypt’s growing corps of “lady guards,” trained to provide protection to high-powered Arab women. Visitors clamped in one of the ladies’ vise-grip handshakes will notice a golden pin on her lapel – a soaring falcon, her employer’s symbol. The Falcon Group, as the Egypt-based security company is known, is pioneering a new model of protection – the female-guard unit - that both signals and supports the rising status of women here. The Falcon Group emphasizes diplomatic solutions over brute force, though the women’s aikido martial arts training and imposing demeanors suggest they have plenty of that, too. In any event, it is clear that Middle Eastern society is apadpting to women’s growing success in the workplace and presence outside the home. Dubai – Women’s College (DWC) graduate Rafia Al Mulla is among that rare breed of people with a drive to succeed no matter what obstacles come their way. Having just turned 21, she is among the nation’s youngest successful entrepreneurs. She owns and runs YogurBerry, a franchise business based in Dubai Festival City’s Festival Centre. 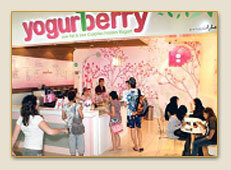 YogurBerry is an international frozen yoghurt brand operating in 11 countries. Rafia’s franchise is the only one in the UAE. Rafia graduated with a bachelor’s degree in Real Estate Management from DWC this month. She has been selected as the class valedictorian for the college’s graduation ceremony being held in February. She also holds a higher diploma in business. "This new fund has tremendous potential to bring about concrete and sustainable changes in women's lives." A new fund managed by the United Nations Development Fund for Women (UNIFEM) Monday announced over 9 million U.S. dollars in grants to support initiatives in 26 countries to empower women, ranging from boosting their political participation in Bosnia and Herzegovina to assisting those denied inheritance and property rights in Afghanistan. The Fund for Gender Equality is a 68-million-dollar multilateral initiative, currently funded by the governments of Spain and Norway, designed to promote innovative programs focusing on women’s economic and political empowerment at local and national levels. Nonprofit organization Nippon International Cooperation for Community Development, or NICCO, has been working to widen career opportunities for Afghan women by promoting literacy and information technology skills. 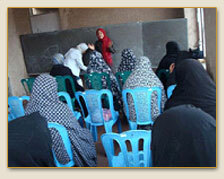 “The literacy rate for Afghan women is one of the lowest in the world. The figure for men is 43 percent, while that for women is only 12 percent,” Kazuki Nemoto, who works for NICCO. “By providing such courses, women who couldn’t earn and depended on men are able to gain information and knowledge by themselves and can educate children with confidence,” he said, adding he believes educating women in Afghanistan will help reconstruct the war-torn country. "It will be a great help," says struggling single mother. Vicknani Nora Giok was divorced 16 years ago and never received a single sen from her husband. Left to support her two children by herself, Nora, whose Muslim name is Nurasyikin Abdullah, started singing in a pub. Women in similar situation like hers no longer need to suffer. The Government will come to their aid with loans. Minister in the Prime Minister’s Department Datuk Jamil Khir Baharom announced yesterday that the Government had approved an allocation of RM15mil for Muslim women who are undergoing divorce and have not been paid maintenance. Non-governmental organisations have cautiously welcomed the move, saying they wanted it to be implemented efficiently and fairly.